Ray Ramon releases new single ‘Dance All Night’ feat. Jenni Ramon | Sonic Smash-Music! The singer, songwriter, composer and music producer known as Ray Ramon has released his latest single, “Dance All Night.” The track has been proudly released independent of support from the corporate music industry on the Ray Ramon Records music label. In addition to the considerable skills of Ray Ramon himself, the single also features the talents of Jenni Ramon. It is Ramon’s first single of 2014. It was produced by Ray Ramon and David Cherry (DJ Andromeda). A dancefloor anthem sure to get any party moving, “Dance All Night” by Ray Ramon has been long awaited by Ramon fans the world over and by fans of house music in general. Ramon has been performing music since the age of six. Originally hailing from Nigeria where he studied at the University of Ibadan, he immigrated to Australia and soon released his first tracks, “My Maker” and “Times” in 2007, both recorded in New South Wales. His third release, “My Healer,” appeared in 2011. His first secular release, “Leave Me Alone,” was recorded in Kent, UK soon after. Ramon was dubbed “Best Male Gospel Artist” at the Afro/Australian Music and Movie Awards in December of 2011. His “I Had a Dream” was published in 2012, for which he won the Best Contemporary Christian Producer Award at the inaugural Indie Music Channel Awards, making him the first Australian and African to be officially recognized at the prestigious event. 2013 saw Ray Ramon winning Best R&B Video for his song, “Times” at the second Indie Music Channel Awards in Hollywood. His Best World Music Producer award was garnered at the third Indie Music Channel Awards for his production of “Tenacity,” featuring his childhood friend, Spydaman, in April 2014. 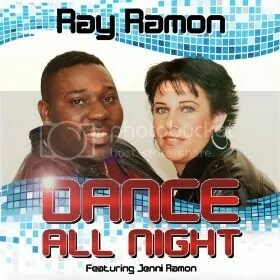 “Dance All Night” by Ray Ramon and featuring Jenni Ramon is available online worldwide. This entry was tagged dance all night, mondotunes, ray ramon.